The post also appears at Teaching Artist Journal’s ALT/Space. What are students actually learning? How do we know they’re learning it? How does arts instruction support other or lifelong learning? What kinds of data can we develop to prove learning and transfer? The process of answering these questions – of assessing student learning – is one of the steps toward shaping the round peg of arts education into the square holes of public education. However, it’s essential to answer them without sacrificing the core qualities that humans gain from their artistic endeavors: expression of self, creativity, passion, and vision. Which is to say it’s April, and I’m thinking hard about teaching and learning in a comprehensive, sequential dance program – because it’s assessment time in dance class! I need to gather data on what my students know and can do, without them feeling the discomfort of having their creativity squeezed and shaped to fit a particular mold. This week, for spring vacation, I scored students’ performance assessments. 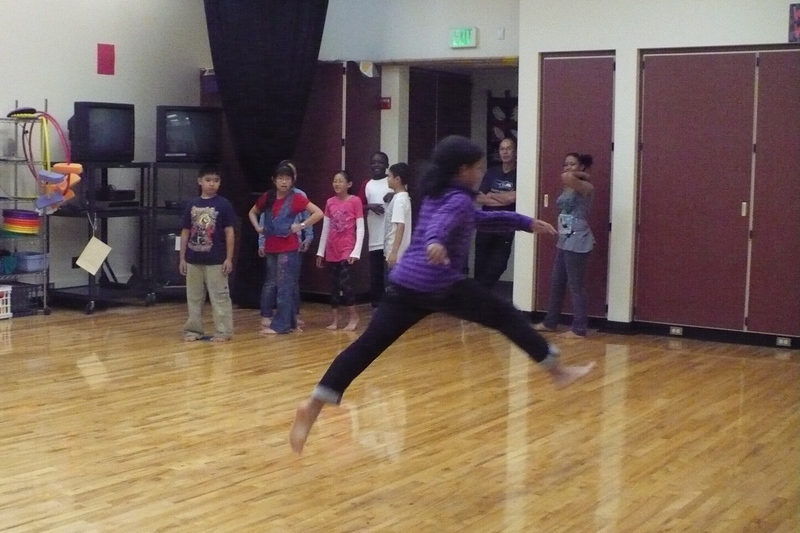 Our dance program includes all students from kindergarten through fifth grade, at a rate of about one hour per week. Instruction consists of lots of creative movement, improvisation using the basic vocabulary of movement (categories of space, time, energy, body), choreography, and cultural dances from around the world. The performance assessment that students complete in fifth grade asks them to choreograph a solo dance based on either a poem or a piece of visual art, perform it for videotaping, and write briefly about their movement choices. The assessments are scored in three categories of Creating (choreographing a beginning, three different movement phrases, and an ending), Performing (performing their dance without interruption, with clear energy and space choices, and maintaining their focus), and Responding (explaining movement choices for three ideas or images from the poem or art). Results from these assessments provide plenty of data concerning the first two questions above: “What are students actually learning?” and “How do we know they’re learning it?” I know it because a performance assessment asks them to do it: translate ideas into choreographed movement, perform their dance with confidence, and explain their ideas. And I know they’re learning because the results are generally good. But the results also provide plenty of fuel for reflection. ~25% of students (7 out of 27) met all criteria perfectly (including four boys and three girls; one African-American student, one African student, four students from SE Asian heritage, and one Caucasian). It’s a relief when I see students of various backgrounds succeeding! ~81% of students (22 out of 27) achieved levels of either competent or proficient. So… many kids are learning in this class, but what about the 19% (5 students out of 27) that scored as emerging rather than competent dancers (an average of under 3 points on a 4-point scale)? They indicate plenty of room for instructional improvement. Looking at them individually, I notice two (a boy and a girl) who began dancing just this year, one boy whose religion disapproves of dance, and two other boys who should have done better – but didn’t. These last two boys are particularly troubling, providing plenty of food for thought in the months to come, as I reflect on ways to improve what they learn. And what about trends visible as weaknesses throughout the class? ~9 students were either missing a third movement phrase in their choreography or their third phrase was too short. Note to self: keep teaching them how to build movement phrases with more than one movement! ~10 students didn’t understand about making their beginnings and endings express the ideas in their dance; instead they created beginnings that said “I’m ready!” and endings that said “OK, I’m done now!” Note to self: start working on stronger beginnings and endings in third grade, at the point when I’m really emphasizing the beginning-middle-ending sequence. ~3 couldn’t explain their movement choices. Note to self: check over the response sheets quickly and collect verbal responses if there’s an English-language-learning or writing problem. ~5 students performed with limp energy and minimal use of space. Note to self: get started early in the year on self- and peer-assessments, so they understand how their movements are coming across. Can 380 students collaborate to put on an end-of-year performance for families and friends?! Yes, most likely. Starting Monday. And happily, building a performance is not at all about making disparate parts fit – it’s at the core of dance, with excitement building daily! This entry was written for ALT/space, online forum of the Teaching Artists Journal. I’ve been honored to be a contributor to the TAJ online exchange of ideas since last August, even as I’ve felt sort of odd-man-outish. Being a certified dance specialist, located in one school for the past fifteen years, my context is quite different from itinerant teaching artists, especially in the most recent (and most stultifying) educational environment. I’ve lived the conflict inherent between teaching dance as a fine art and teaching in the public school system, having been an itinerant teaching artist in studios and schools through my 30s, before becoming certified in my 40s. While working within the public school system, I’ve advocated for the place of dance education by participating fully in the process of reshaping dance as a content area (e.g., creating grade level standards and expectations, writing assessments, aligning curriculum, integrating other academic subjects). I attend all building leadership meetings and budget planning meetings; I facilitate a professional learning community and district curriculum alignment team. While all these measures seem necessary in order to carve a place for dance in public schools, there remains the struggle to nurture what I know and love about my art form, in order to share it with children who deserve a chance to dance. For me, this conflict plays itself out on a daily basis. I try to plan units that include formative and summative assessments, units that also meet the state’s grade level expectations, including daily teaching points that encourage students not just to dance but to think and verbalize what they know about dance. At the same time, I try to get the kids moving, give them a chance to be swept along by the flow of creating, and dancing together – experiencing the spark that has kept me dancing all these years. We’ve been back to Merida, a place where dance seems synonymous with everyday life. This time we happened to arrive in the midst of Carnaval. The parade we saw (one of 6 throughout Carnaval week) was fun, although it’s definitely not the best dance we saw this week! We tried for some other parades, but heat, sun, crowds, laziness conspired against us. I posted my article “Too much to ask: dance without music” (about religious restrictions on music in a dance classroom) to a forum of fellow dance educators, and their responses were very helpful – thoughtful and well-considered! They did research and sent me links, they referenced their own context and made suggestions, they commiserated and sent their support. So… upon reflection, where am I now on the issue? First, I will continue teaching a sequential, comprehensive dance program, including music. My elementary school has dance instead of music, so I feel a particular responsibility to provide exposure to music, which is not only a soul mate of dance but also a required academic subject. Second, I can incorporate activities to accommodate the students whose father has expressed discomfort. In this particular case, percussion & voice are more acceptable than instrumental music & melody. Keeping this in mind, I can make a conscious effort to increase the percentage of improvisational & choreographic projects using percussion & poetry instead of instrumental music. I am fairly committed to forestalling the day when students or families opt their children out of dance class, although it may be inevitable. About 10% of my students belong to communities that look askance at music & dance to varying degrees. If one family opts out, the problem may expand exponentially with other families joining the exodus. In my 15 years of teaching in this school, I’ve been lucky that this is the first outright request. So long as all students in the school are included in the program, I’m able to build an all-school dance culture, nurturing social & collaborative skills that really contribute to our community. And I’ll continue to communicate with parents over the long-term, face-to-face and on a wider scale. I would guess that one of the reasons that families choose my school is that it’s a delightful community where children from many places in the world get along well together, which is perhaps partially due to habits our children develop by learning & playing together in dance. This, despite the diversity of our population: Our 98118 zip code was reported at one time as being the most diverse in the nation. This point is one I can continue trying to articulate to parents, as I did in placing a video on our website, specifically for the purpose of explaining the dance program to current & prospective parents. So in conferences & in the community, I can redouble my efforts to communicate. I’ve seen one or two of these photos before, but what a collection! Here’s a lesson I’ve used with 5th graders over the years. Often I integrate this lesson with other lessons on Martin Luke King Jr. and Alvin Ailey, since they were contemporaries — all alive & working toward change during the civil rights movement. * I’m posting this lesson just now in response to a Read & Romp Roundup at Kerry Aradhya’s Picture Books & Pirouettes blog. No one would classify Langston Hughes’ poem as children’s literature, but 5th graders are still children, and the poem is a great window into the world for them. The lesson is based on “Dream Variations” by Langston Hughes. This is an improvisational structure I learned from Thom Cobb during an NDEO National Conference session (was it in Providence, Rhode Island?) – Thank you, Tom! It’s served my students & myself very well over the years! Teach a phrase of choreography built on 3 words or images from the second stanza, modeling with an explanation of how the movements were chosen to express the words. Create a sequence appropriate for your students; how specific you are on details of the choreography will depend on your students. Practice & repeat to cement the sequence of the phrase, with smooth transitions. Rehearse with the words as cues, or not. Now it’s their turn… with a partner, students choose 3 words, images, or phrases from the first stanza, create a movement phrase to express each image or phrase, and practice their phrase. If you have time, they can add the choreographed phrase you taught them as an ending to their own. Have students watch each other’s choreography. Several pairs can perform at once; if they add the learned choreography, each pair will do that second, and it will probably be performed in a kind of canon, with each pair doing the same final moves at different times. 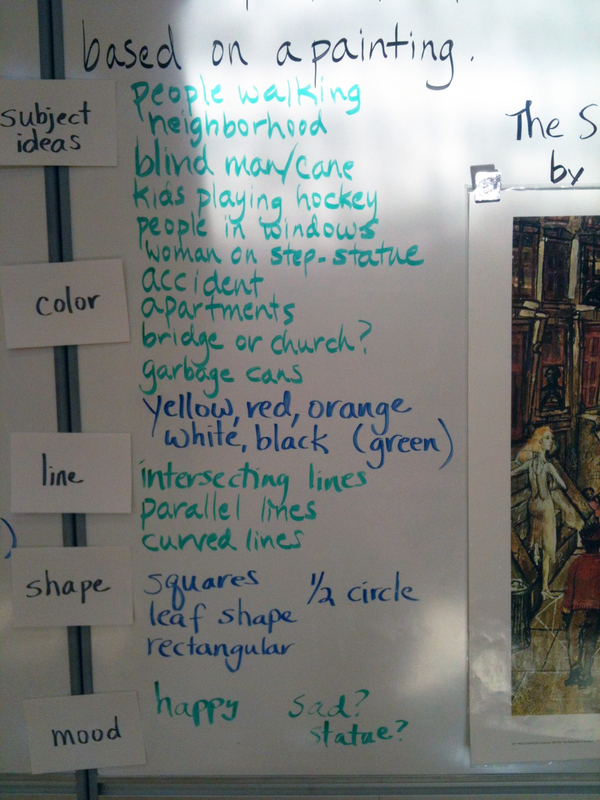 Ask the audience to watch for & identify words or phrases they see from the poem. Or else have the dancers identify one of their images & explain how they chose to express it with movement (either verbally or in writing). I have parents who aren’t too sure what this dancing business is all about. They don’t necessarily speak English, many don’t have time to come to school and talk about it, most come from a different culture or world view. So I made a video and put it on the website. Truth be told, it was a lot of trouble. I had to collate 370 permission slips in order to videotape kids and post them on the school’s website. I had to get someone to videotape the performance (usually someone without any particular expertise but with a willingness to man the videocam through the whole performance). I had to revideo the classes that included kids without permission to videotape. Then, I had to learn how to use iMovie. And figure out how to put it on the web without Youtube, which has a less-than-educational reputation among my community of parents. And redo our school’s website so there would be a place for the video on it. Here it is on the school website: The Dance Program. Kindergarten: The Shoemaker, which gives 5-year-olds a chance to practice all the basic locomotor skills during rehearsal. First grade: The kids were studying weather, so their dances include a song about the colors of weather and an improvisational structure accompanied by weather cinquains they wrote and narrated. Second, third & fourth grades: We tried a musical for the first time ever: Character Matters by Bad Wolf Press. We all enjoyed it & I figured out some things I’ll do differently next time! Fifth grade, group 1: A dance telling the story of The Magic Fan by Keith Baker, inspired by the kids’ concern about the tsunami in Japan, April 2011. Fifth grade, group 2: The kids’ choreography, with a [very] tangential connection to biographies they wrote about role models in American history and culture. I may do this again someday, so if you have any pointers, do let me know! Alimah and Farihah are my students. They’re both cheerful, attentive, kind, lively, quick, and participatory. Alimah, a 1st grader, is shy, but she’s a great partner for anyone in the class. Any student, boy or girl, calm or wildly off-task, gets their work done when paired with her, because she can be on-task and have fun at the same time. Her sister, Farihah, is in 2nd grade, and she’s joyful and happy, as her name suggests. * She’s also a great partner, but not a bit shy. She loves to demonstrate, with me or with a fellow student, doing a practiced move or trying something for the first time. It’s such a pleasure to dance with these girls. They dance as if they love it, and they offer so much to their classmates, as we develop movement skills, learn cultural dances from around the world, and choreograph dances to express ideas and feelings from the classroom. They thrive in this public school classroom, where dance as a fine art qualifies as one of the required content areas for a model education. But I feel such sadness as I look ahead, because they’re bound to experience tremendous conflict in my classroom. Although they’ll remain their friendly selves outside my class, open & enthusiastic in their greetings, their presence inside the classroom will change: movements restrained, participation reserved, and expressions guarded or even sullen. Last month, their father contacted me with a request to remove them from dance class. Although my school has families for whom dance is not acceptable, that was not the main issue in this case. In this case, his note cited religious restrictions on cross-gender contact (especially touching) and listening to music. He asked to have them placed somewhere else during dance class. There are several things he didn’t realize. First, within a public school, there’s no surplus of adults to supervise children who want to be somewhere else. And second, given research suggesting that music and dance support academic achievement in positive ways, you can’t escape music by moving from one location to another in a public school. Every teacher is encouraged to integrate the arts! We met & talked, Dad, myself, the girls’ teachers, the principal. I can — and d0 — offer alternatives to cross-gender contact. I teach that anyone can be your learning partner, in dance as well as science, reading, or math. But we explore ways of being connected without touch, as you would in science, reading, or math. Picture two partners facing each other, with hands palm-to-palm — not touching but with a 2″ cushion of space between the palms. Students can do space-between elbow swings, space-between leading and following, space-between turns. But music! How can you take music out of dance class? …when all the children love it? In deference to families that feel the conflict between their traditions and the society in which they find themselves living, I already limit our musical repertoire: instrumental selections that offer rhythmic variety, clear listening cues, and lyrics chosen to support educational concepts and content. But music & dance are interwoven, through energy, accuracy, synchronicity & just plain fun. So we’re stuck, I with my experience of what music can offer, and the girls with their developing awareness of how music is viewed at home. I with my vision of how the girls will be affected over the years to come, and the girls, as yet unaware of how life in two cultures will feel. If you have a clue that will help me teach these beautiful children, please share your ideas!